When I was a kid, winter has officially arrived when I see hawkers push out their huge black woks filled with burning hot coals on a wooden cart. You’ll know from afar because of the loud “cling cling clang clang” sounds they make with their long wok spatula as they flip the coals. As you walk by, you just couldn’t resist the warm sweet smell of sweet potatoes (or chestnuts). “Baked” sweet potato is one of the Hong Kong street food classics. The sweet potatoes are slow cooked with the coals’ heat. Final texture is soft & creamy smooth, somewhat similar to those of mashed sweet potatoes. This ultimate hearty comfort food is simple, frugal, nutritious, satisfying, and delicious. 1. 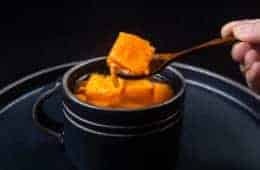 Sweet Potatoes Sizes: After experimented pressure cooking various sizes of sweet potatoes, 1″ chunks or cubes bring the best results. They cook faster and more evenly. 2. Seasoning: In step 3, be sure to season with salt to enhance the flavors and balance out the dish. 3. Looking for other Side Dish ideas? Check out our Pressure Cooker Mashed Potatoes Recipe. Now it’s YOUR turn to take out your pressure cooker and make some Creamy Pressure Cooker Mashed Sweet Potatoes! 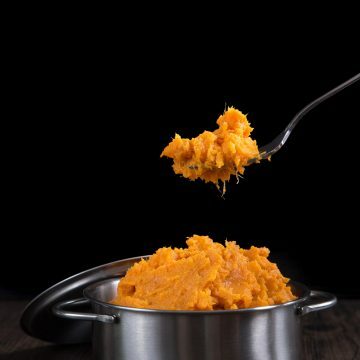 5 mins prep to make this Easy Creamy Pressure Cooker Mashed Sweet Potatoes Recipe. Buttery smooth, sweet & savory side dish, full of texture & fragrance. Sure to be a hit at your dining table! Peel and Cut: Peel and cut the sweet potatoes into 1” chunks. Pressure Cook the Sweet Potatoes: Pour 1 cup of cold running tap water and place a steamer basket into the pressure cooker. Place sweet potato chunks into the basket. Close lid and cook at High Pressure for 8 minutes. Turn off the heat and carefully do a quick release. Open the lid. 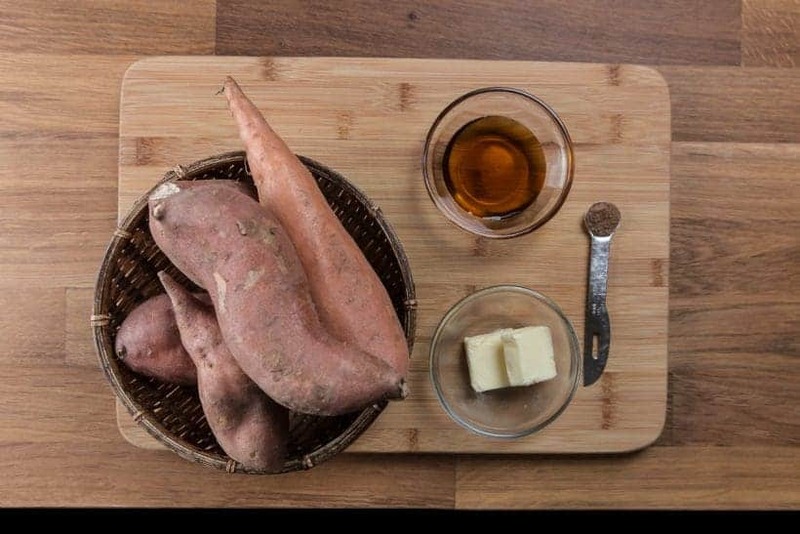 Mash the Sweet Potatoes: Place the cooked sweet potatoes in a large bowl. Use a potato masher to partially mash the potatoes. Add ¼ tsp nutmeg, 2 – 3 tablespoons of unsalted butter, and 2 tablespoons of maple syrup to the sweet potatoes. Mash and mix the sweet potatoes into desired consistency. Taste and season with a pinch of fine sea salt. 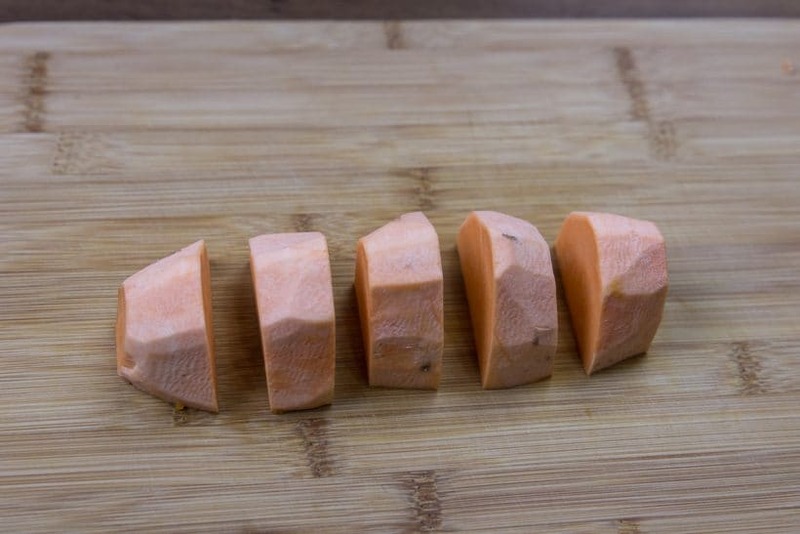 Sweet Potatoes Sizes: 1" chunks or cubes bring the best results. They cook faster and more evenly. Seasoning: In step 3, season with salt to enhance the flavors and balance out the dish. What does the trivet look like? 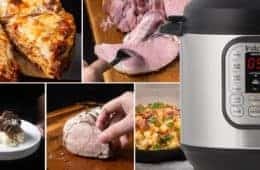 Can I put it right on the little steamer that the instant pot cane with? 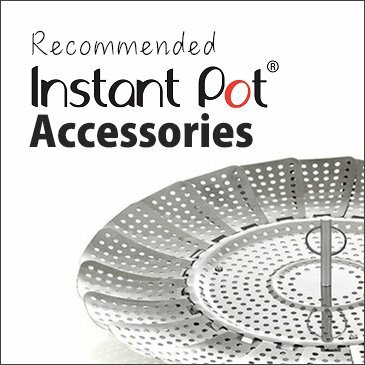 You can just use the littler steamer that came with the Instant Pot. I wonder WHY I can not copy your Mashed Sweet Potato Recipe ? Do I need to join your site or Just put your site in My Favorites List ? 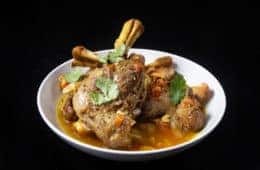 You should be able to print the recipe using this link. You don’t have to join our site or anything as this site is completely free. 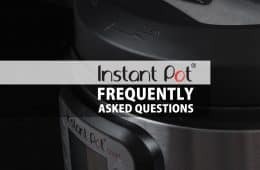 What is the maximum number of sweet potatoes one can make at one time using the Instant Pot? I am preparing a huge TG dinner. I expect to have to use the pot several times. Just wonder what is the capacity? Just don’t pack them too tightly and you can place as many as you can fit (below the max fill line is ideal). I’ve read several recipes that have you using orange juice for the liquid, which would add lots of flavor, but I’ve seen mixed reviews on whether or not it would make the recipe “un-paleo.” My thoughts would be that it could possibly be made this way if you used fresh squeezed OJ, not processed. Thoughts? For our recipes, we used fresh squeezed OJ. I love your site! I saw recipes that skipped the steamer basket but it seemed a bit odd to me to cook them in water that would be incorporated into the dish. However, if you use orange juice, it suddenly seems ok to me to incorporate. If doing so, would it make sense put seasonings inside to cook with it (like I do with the slow cooker)? Or do you think it is better to season afterwards? Thank so you much for all your generous assistance. Happy Thanksgiving! 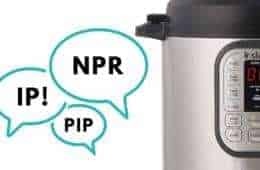 I’ve tried this twice now- at first with 1 cup of water and the second time with 2 cups-and each time the instant pot has given me the “burn” reading, and I’ve had to remove caked, burnt bits of sweet potato from the bottom. Any idea what I’m doing wrong? Is the mashed potatoes on a steamer basket or trivet? 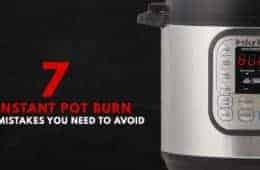 It sounds like the Instant Pot was leaking steam from the lid. Make sure the venting knob has turned to the sealing position and the silicone ring is seated properly. there is a recipe video right above the recipe card. If you are a visual learner, it will be useful to you. Just made this, and it came out great! Thanks for the tips! I’m guessing you peel the sweet potatoes first?! I’d love to make this, but I don’t have a steamer basket for my instant pot. Can I put the trivet in the bottom and lay a few strips of foil across the trivet with the potato chunks on top? You can layer the sweet potatoes right on the trivet. Additional foil may prevent the steam from cooking the potatoes properly. Tried this tonight and like your other recipes, it was spot on. Thank you for yet another delicious (and reliable) recipe!